Each year, on the first weekend of May, the pirates invade. Or so they say. 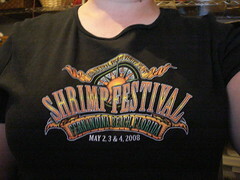 So we caravanned up to Fernandina - my family and our friends down the street - and went to the Shrimp Festival. We saw a couple of pirates. We smelled a lot of shrimp. But we missed the "invasion" and the lines for shrimp that might be delicious and might be food poisoning on a plate were just too danged long. It was a lovely day and so everyone in NE Florida decided to come out and play. I got a tee shirt out of the mix. I also discovered that I *might* have the power of invisibility. Because I got stepped on, ran into in, and run over by SEVEN strollers. And nary an apology was spoken. This of course leads me to a moral quandry. If I *do* truly have the power of invisibility, will I have the moral fiber to use my powers only for good? Of course the other more plausible explanation is that NE Florida is full of rude rednecks. The saving grace of the day was the 2 hours the eight of us spent at the beach. There were sandcastles and wave-jumpers and all manners of cute & happy children. And the adults were feeling good as well. The beach is good for what ails you. My youngest sister (I have three) had a baby on Wednesday. And I have no cute baby knits to show for it. 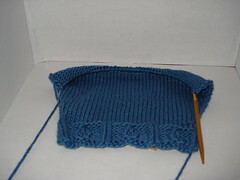 So I'm knitting up the peapod baby set in some lovely wedgewood blue Berocco Comfort DK. I have no illusions that my sister will have the time to handwash anything. So acrylic, here we come! I'm also gonna whip up a baby blanket of some Muench Big Baby. Poor acrylic covered baby. At least he will be cute while he's covered in petroleum byproducts. In the really good news department, I'm getting some very positive feedback on the surrey hat. So yay for the good stuff!